Property 31: Nice smallscale chalet park on the lake in the Auvergne. Ardèche, house in front of the river. Property 33: Ardèche, house in front of the river. 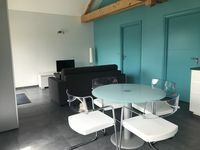 These small gites are very nicely finished, clean, modern and perfect for a couple. They would also be child friendly and good for a small family. We, a couple, stayed in October, 2018, and the units appear almost new. The kitchen is very well furnished and good for any type of meal preparation. Conveniently located for all services, though a car or bicycle is recommended. Wifi/internet services are very good for those who may need it for their work or family contacts. Mazes, the actual location of the gites, is more like a suburb of Vallon. Would definitely recommend and stay again. 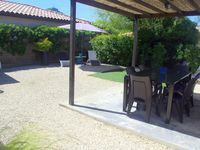 The owners are very accommodating and their local representative/housekeeper was friendly and efficient. Thank you to the owners for a very nice and comfortable stay.